Don’t miss this incredible poet! 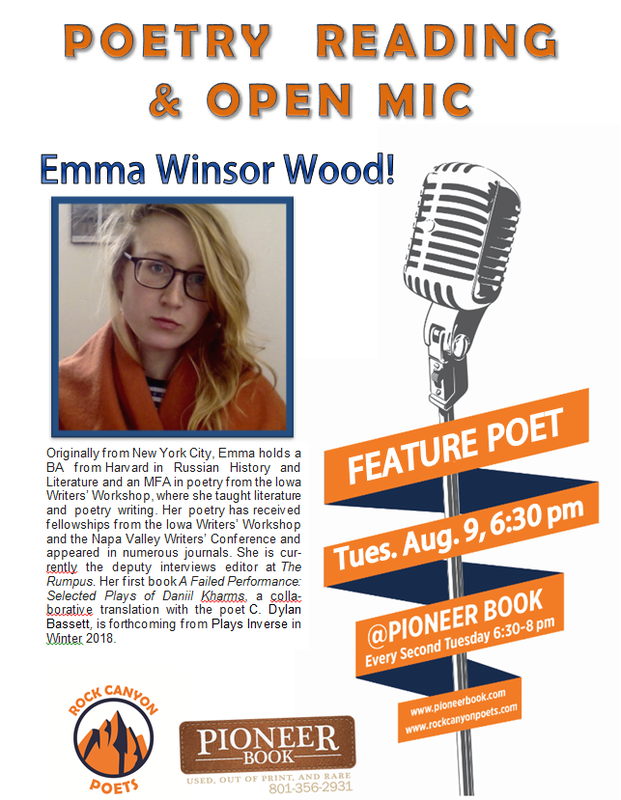 Emma Winsor Wood, originally from New York City, she holds a BA from Harvard in Russian History and Literature and an MFA in poetry from the Iowa Writers’ Workshop, where she taught literature and poetry writing. Her poetry has received fellowships from the Iowa Writers’ Workshop and the Napa Valley Writers’ Conference and appeared in numerous journals. She is currently the deputy interviews editor at The Rumpus. Her first book A Failed Performance: Selected Plays of Daniil Kharms, a collaborative translation with the poet C. Dylan Bassett, is forthcoming from Plays Inverse in Winter 2018. Wood visits Provo as a guest of Rock Canyon Poets. The reading is open to the general public. For more information, contact the Rock Canyon Poets, rockcayonpoets@gmail.com.